Open casting calls are rare in the Southeast, but when we hear about them we are going to let you know! 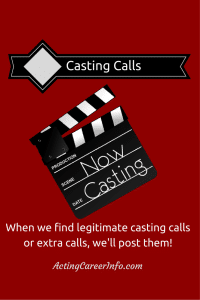 Fincannon & Associates (highly respected casting agents) are looking for a specific role and are doing a rare open casting call on Saturday, Sept 10, 2016, in Nashville. To be cast: CLAY, a young African American musician in his mid-twenties who is destined for great things. He is a creative, self-aware, highly motivated young man who suffers intense mood swings, but is nonetheless charming and outgoing. His musical style is eclectic, with modern elements but also nods to roots Black music, Bluegrass, and even classic Country. Candidates must be between 21-26 years old (or pass as such), have a great singing voice, and play either guitar or keyboard. Full details can be found at PR Newswire. If you do not fit the criteria, show up without a picture, a guitar/keyboard, are late or not prepared to sing. Do not bother! Follow instructions to the T!!! This tip is not something to dismiss; they will not consider you if you cannot follow basic instructions so READ carefully! Listen to their instructions and get there early!! Follow us on our Facebook Page or Pinterest Page to hear about it as soon as we discover it!